A University-accredited FPMT Basic Program! Rinpoche at Kachoe Dechen Ling, USA, November 2010. Photo by Ven. Roger Kunsang. Rinpoche wrote this advice for all centers that are in rural areas where hunters may be and also for people who have land and do not want people to harm animals on their land. Rinpoche said that sometimes people don’t know what to say, except to say “don’t harm the animals” or “not to hunt,” so this is Rinpoche’s idea of how to express the concept so that it makes the hunters think. however, could be in different colors and different sizes so that the notice stands out and is beautiful. 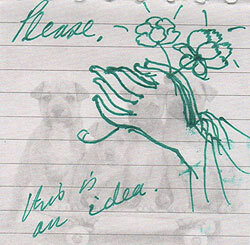 Rinpoche advised that the sign should include visual images to make the meaning clearer, such as Rinpoche’s drawing above or photos of mothers with baby animals showing love and affection. Because just as you want to be loved by others (every living being) the animals also want to be loved by you, as you are most precious one. Every one of the deers are extremely precious ones. They don’t want to receive harm from you, as you also don’t want to receive harm. It is just that the deers are now in animal form and are unable to express themselves through TV, newspaper, and doing demonstrations, so all they can do is run away when they see you harming them. The annual long life puja offered on behalf of the centers, projects, services and students of the FPMT to our most kind and immeasurably precious Spiritual Director, Lama Zopa Rinpoche, source of our inspiration and guidance, will be offered at Kopan Monastery on December 10, at the end of the annual one-month course. Having the continued guidance of the guru depends on the merits of the disciples. We need to create the cause for us to keep meeting with the precious guru in future lives until we attain the highest goal of enlightenment for the benefit of all. 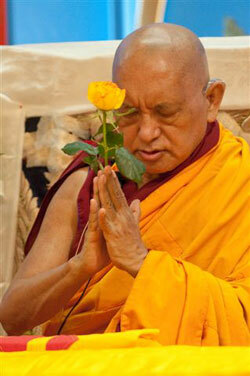 Guru devotion is the glue of the FPMT organization. Our devotion to Rinpoche is best expressed by following his advice, which includes offering service to manage, sustain and develop the centers, projects and services which are under Rinpoche’s spiritual direction. By following Rinpoche’s advice and also offering long life pujas, FPMT students are accumulating the merits so that our precious guru will stay in the world with us for a long time. Rinpoche also mentions regularly that offering long life pujas is a cause for one’s own long life. Centers, projects and services can make your annual donation for the long life puja of our holy guru via the secure site linked to from the FPMT Affiliates Area. Students who would like to donate can do so via our webpage. The deadline for us to receive your donation if you would like your center/name to be included in the list of donors is December 7. Excerpted from Ven. Roger Kunsang’s blog Life on the Road with Lama Zopa Rinpoche (posted on November 21, 2010). Ven. 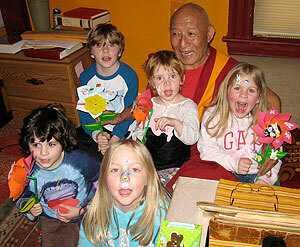 Roger’s very entertaining blog enables us all to keep up with Rinpoche’s activities. “Over the past couple of years Rinpoche has been ‘planting’ plastic flowers in the garden of his retreat house in Washington State, USA. 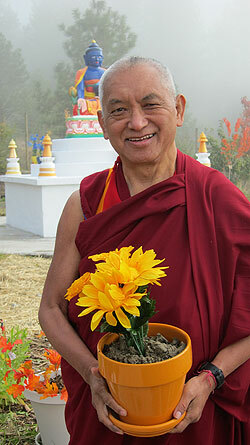 Why would Rinpoche plant beautiful plastic flowers in the garden? The answer is very simple: the deer won’t eat them and during the winter when it is very cold and the area gets a lot of snow, there can still be offerings of beautiful flowers to the holy objects. easy job because this stone is very hard. Currently Rinpoche is doing a short, strict retreat. After, we leave for Nepal [for the Kopan one-month course]. 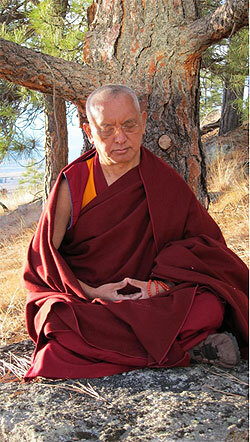 Starting retreat isn’t a simple process for Rinpoche. Apart from the normal things such as making tormas, etc., there is the ‘organization work.’ Rinpoche always makes an effort to clear up some of that first. This time, it took about two weeks: letters from students and then FPMT work, which can be all sorts of things. We rejoice that, thanks to a kind benefactor, FPMT is sponsoring the venue for one day during His Holiness the Dalai Lama’s Kalachakra initiation and teachings in July 2011 in Washington, D.C., USA. Rinpoche teaching at Maitripa College, USA, November 2010. Photo by Marc Sakamoto. Rinpoche often advises that we should visualize specific centers and homes around the world at which students make extensive daily offerings whenever making offerings ourselves in order to greatly increase our own offerings. To support this practice we have collected photos from some of these centers and homes, together with information about offering practices from FPMT Education Services, and put them all in one place. By visualizing these extensive offerings and then mentally offering them, we gain the merit of making extensive generosity, but without needing the time and space required to set out hundreds of water bowls, lights and so on! We hope this will provide a helpful service. In November 2010, FPMT was extremely happy to able to offer US$19,561 for the monthly stipends of the current abbots, past abbots and main teachers of the Lama Tsongkhapa tradition, including the Ganden Tripa. small monthly offering supports the teachers in their incredible work of transmitting the teachings of the Buddha. FPMT also was able to offer US$7,789 for the annual Gelug examination that was attended by over 567 of the foremost scholars from Sera, Ganden, Drepung, Gyume, Gyuto, Tashi Lhunpo and Rato monasteries. This year, the exam was held at Gaden Lachi Monastery on August 11. This money covered the cost of travel for the monks traveling from Sera Je and Sera Me, as well the cost of offering food and tea to all the 567 monks attending the exam. Thank you to all the kind benefactors who continue to support the Lama Tsongkhapa Teachers Fund. Please rejoice in this incredible offering that we are able to make which is really preserving the Mahayana teachings worldwide! The new Mandala eZine, an annual “best of” Mandala compilation, is now live! Enjoy select articles from Mandala‘s rich archive as well as audio and video features, teachings from Lama Yeshe and Lama Zopa Rinpoche, plus much more! For the first time, students of the FPMT Basic Program can qualify to receive university credits. The next cycle of the BP (January 2012 – December 2013) at Istituto Lama Tzong Khapa, Italy, will be accredited by an Italian university, the Sant’Anna School for Advanced Studies. Full-time residential students who fulfill the academic, meditation and service components in relation to the first eight subjects of the BP will receive 90 university credits and be awarded an International Master’s in the Preservation and Development of Wisdom Culture and the Art of Liberation. Students who fulfill the academic, meditation and self-study components of the parallel online program will receive 20 university credits. Students who also complete the ninth subject, the Grounds and Paths of Secret Mantra (offered as a summer intensive in 2013), pass the final comprehensive exam, and fulfill the lam-rim retreat requirement will receive the FPMT Basic Program Completion Certificate. Applications for the International Master’s in Wisdom open December 15, 2010. A maximum of 60 students will be accepted into the program. Applicants are not required to possess a Bachelor’s Degree. The International Master’s in Wisdom does not permit entrance to a Ph.D. program. More information on the Master’s in Wisdom is available through Istituto Lama Tzong Khapa. Meditation 101: An introductory course on basic Buddhist meditation techniques for complete beginners. It teaches basic Buddhist meditations that can be used by anyone to create more peace and happiness in daily life. Living in the Path: The fourth and last module from 2009, Guru is Buddha, is now live. It covers the heart of the path – seeing the guru as inseparable with Buddha. You don’t want to miss these precious teachings provided as video clips, transcripts, meditation instructions, and mindfulness and service exercises. Basic Program: Mind and Cognition Part Two, Minds and Mental Factors is an introduction to Buddhist psychology, identifying the mental factors that constitute the basis of our daily experience and defining the various positive and negative emotions as well as the cognitive states relevant to practice of a liberative path. The teachings by Ven. George Churinoff at Land of Medicine Buddha are based on Kachen Yeshe Gyaltsen’s A Necklace for Those of Clear Awareness Clearly Revealing the Modes of Minds and Mental Factors. The enrollment keys for all of the above courses are available as a benefit of Friends of FPMT at certain levels or can be purchased individually in the Foundation Store. Please also see the Online Learning Center User Guide for a complete list of all the free online courses which are available. The all new stand-alone Lama Chöpa Jorchö practice booklet is coming in December/January. Education Services is now making this most important practice booklet available with the Tibetan. For those not yet familiar with the new practice layout of this practice, you will find the new edition very user-friendly. The new edition also includes scriptural references for most of Lama Zopa Rinpoche’s additions. This volume is a must have for all centers! Think about printing it locally or putting it in your 2011 budget to purchase copies for your gompa. FPMT Translation Services is organizing its first international meeting of the Lotsawa Rinchen Zangpo Translation Team (LRZTT) at Istituto Lama Tzong Khapa, Pomaia, Italy, May 13-20, 2011. The meeting will focus on the need to standardize translation terminology in FPMT translations and look at how to accomplish this. Translators and editors will discuss the translation process, share translation resources, talk about difficult terms and learn how to work as a team. The meeting is open to all FPMT and FPMT-affiliated Tibetan-English translators, interpreters and editors, as well as representatives of other-language FPMT translation offices and teams. Check out the cool new translate tool on the Foundation for the Preservation of Mahayana Tradition! You’ll find a drop-down menu on the right-hand side with your choice of 17 different languages. Check the latest Foundation Store newsletter for new product arrivals and monthly specials. Living in the Path: Two NEW docs available! A short Guidelines for Centers on how to host the program and Living in the Path Facilitators Role are now available in the FPMT Affiliates Area. Also, please let Merry know when you host LP modules in your center. Discovering Buddhism: Please send Merry any DB Retreat dates you have scheduled for 2011. Geshe Tsulga (Tsultrim Choephel) resident teacher at Kurukulla Center, Boston, USA, for nearly 20 years passed away on November 21 from liver cancer at the age of 71. Geshe-la was born in Kham, ordained at 7 and entered Sera Monastery at 17. Fleeing the Chinese occupation in 1959, he stayed at Buxa refugee camp before going to Bylakuppe in south India to help build Sera in exile. He received his geshe lharampa with highest honors at the top of his class in 1988, and in 1992 came to America to teach. He patiently taught his Western students many traditional Buddhist texts but it was the visits of little children that he especially enjoyed. “Although the direct provision of anti-leprosy drugs was taken over by the state health services eight years ago, a number of activities remained unattended. Thus, MAITRI was entrusted with working in the district of Gaya and providing assistance in the identification of new leprosy cases, the prevention of the occurrence of deformities in leprosy patients (or hansenians), the care of disabled patients both in the field and at its hospital, and the dissemination of awareness about the disease and its treatment. It is important to stress that leprosy has not been eliminated and the number of infectious cases has been in the upswing for the past four years. This is why the work of an organization like MAITRI is more vital than ever. On World Leprosy Day (next year on January 30), MAITRI spreads awareness among the population of Gaya District. We also celebrate the selfless work done by thousands of workers in India and around the world. Events are organized all over the world to raise funds to support the eradication of the stigma attached to the disease and to give material and psychological relief to those with the disease. MAITRI requests other FPMT centers, projects and services to help raise awareness in their communities on World Leprosy Day about leprosy, be they Buddhist or not, and to appeal to their generosity to help de-stigmatize the disease and encourage others to treat those with leprosy with dignity and compassion. Both Losang Dragpa Centre, Malaysia and Amitabha Buddhist Centre, Singapore, put out calls to students to help support victims of the recent floods in Thailand – and students responded magnificently. “ABC recently raised S$18,000 (US$14,000) in a few days to buy 3,000 blankets, food and water for distribution to 3,000 Thai flood victims. This was done through Ms. Irene Ong, a Singaporean living in Bangkok. Khen Rinpoche Lama Lhundrup went out to bless the homeless and hungry villages while he was there. Both wanted to thank all the generous benefactors and members who kindly donated to make this mercy relief operation such a success. Daniel Mestre and Sylvaine Litaud are developing an FPMT retreat facility high in the mountains above Marseilles, France. The development of the retreat facility is supported by growing organic lavender – what a delightful combination! Kushi Ling Retreat Centre in Italy is looking for a general manager, while Root Institute in India is urgently looking for a nurse.